Projectory is owned and operated by Wade Business Media Pty Ltd (WBM). These terms govern your subscription. These terms, together with the Conditions of Use, form part of the general terms and conditions governing the material on, use of and access to the Projectory site. WBM may change these Subscription Terms at any time in its sole discretion. You are responsible for ensuring that you regularly review these terms and any other notices or communications made by WBM relating to your subscription. By continuing to use the site, you agree to be bound by changes to these terms. When you register with WBM to use Projectory.com.au, you will use a username and a password of your choosing to access articles. Password can be modified at any time. There is a limit of 16 personnel from your organisation that can access content on Projectory.com.au or receive the Projectory.com.au e-newsletter. However, only the person registering for subscription to Projectory.com.au can authorise additional users to access content and receive the e-newsletter; this must be submitted to WBM in writing by the individual registering for subscription. It is a breach of Projectory's subscription terms to provide access to non-employees of the subscribing company. Employees of subsidiary companies to the subscribing company and contractors to the subscribing company are not eligible to access content on Projectory.com.au. Authorised users are determined by the subscribing organisation’s Australian Business Number (ABN). Subscribers must ensure that their password remains confidential at all times since they are entirely responsible for all use, activities and charges associated with or arising from any use of their username and password (regardless of whether they authorised such use), including unauthorised use of the credit card associated with registration of the subscription. Each password must be used by a single user and is not transferable. An attempt to login with an email address and password that is already in use will disconnect the other user. Subscribers must notify WBM immediately if they become aware of any unauthorised use of their email address and password. WBM may monitor usage and unauthorised usage of Projectory.com.au (including but not limited to concurrent usage of email address and password ) and may take any action it deems appropriate, including immediately terminating subscription. Please note that if you have a subscription to Projectory.com.au, your email address and password must not be shared. WBM reserves the right to change the subscription fee it charges in connection with Projectory.com.au at any time and will provide you with no less than one month's prior notification of any such change. These sorts of changes include, but are not limited to, adding fees for new/optional products and/or modifying fees for existing products. By subscribing to any services (including additional products that may be offered from time to time) with which there are associated fees, you agree to pay those fees. If you do not want to pay these associated fees, you must cancel your subscription. Unless stated otherwise by WBM, in order to register for a service or product, you must submit valid credit card details. When you submit your credit card details during the registration process the card details will be checked for validity and the payment will be processed immediately, or otherwise immediately after the 21-day free trial of Projectory.com.au, if applicable. If you are paying by cheque then your subscription commences on the day that your cheque is banked by us. If, subsequently the cheque you sent is not cleared, your subscription will be cancelled and you will have to make a new payment. Whether you pay by credit card or cheque, you will be given notification via email of the commencement of your subscription ("Commencement Date"). Subscription fees and all other fees and charges associated with your subscription (including, but not limited to, any applicable federal, state, and local taxes) will be billed automatically to the credit card you provide when registering for the applicable service. If you do not notify us of changes to your billing details, WBM will assume that all of the information related to your credit card remains valid and will submit to the card processor all information that it requires for approval, both when you initially subscribe and, if applicable, upon the commencement of any renewal of that subscription. If any subscription fees or other charges billed to your credit card are not processed for any reason, WBM shall have the right to suspend your subscription until such subscription fees or other charges are paid in full. You agree to pay all costs (including legal fees) incurred by WBM in collecting any unpaid subscription fees or other charges from you. If payment in full is not received from you, WBM reserves the right to cancel your subscription. Subscription fees will be based upon the subscription rates in effect at the start of each subscription term and apply whether or not you actually use Projectory.com.au during that term. You cannot suspend your subscription to Projectory.com.au. Unless stated to be otherwise, charges referred to for use of any services provided by WBM are GST inclusive. Where GST applies, upon payment for online credit by you, WBM will deduct the GST it incurs from each payment and WBM will issue you with a Tax Invoice at the end of the tax year upon your request (which can be made to Customer Service). The balance of the payment will be credited to your account. GST means the Australian goods and services tax charged under A New Tax System (Goods and Services Tax) Act 1999 (the "Act"). Tax invoice means tax invoice as defined by the Act. Subscription fees are non-refundable. WBM may, however, at its sole discretion, agree to refund any amounts in exceptional circumstances. your use of or access to Projectory.com.au violates any applicable law or regulation or otherwise inhibits any other subscriber from using or accessing Projectory.com.auor any other service offered by WBM. None of the foregoing limits any other legal, equitable, or contractual rights available to WBM. WBM may, in its sole discretion, choose not to renew your subscription by providing you with notice via email of non-renewal at any time during your subscription term. In the event of the foregoing, your subscription will cease immediately. 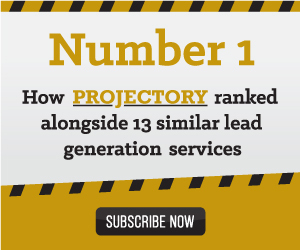 By subscribing to Projectory.com.au, you agree to opt in to email tips, marketing communications and newsletters. You may unsubscribe from each of these communications using the unsubscribe function at the bottom of each email or by calling Customer Service. If you sign-up to a free 21-day trial subscription to Projectory.com.au ("Trial"), it will begin on the date on which WBM accepts your registration. If you wish to subscribe to Projectory during your trial, click on the Upgrade to Full Membership link once logged in or contact WBM. If you wish to subscribe to Projectory after your trial has expired, you will need to contact WBM. If you have previously received a Trial, you will not be able to access full reports on the site. However, requests to re-trial the site will be considered; for more information contact WBM. Please contact Customer Service, at any time, to discuss changing your service. This clause below only applies if the phone number you have provided to us for your subscription is primarily used for private or domestic use. You agree to receive phone calls relating to your lapsed or cancelled subscription for up to 36 months until you notify us otherwise. If you do not wish to receive such phone calls from WBM, You can notify WBM here.